Here is the roast I purchased. It is a nice cut, although I would have preferred one that was a little wider and not quite so tall and narrow. 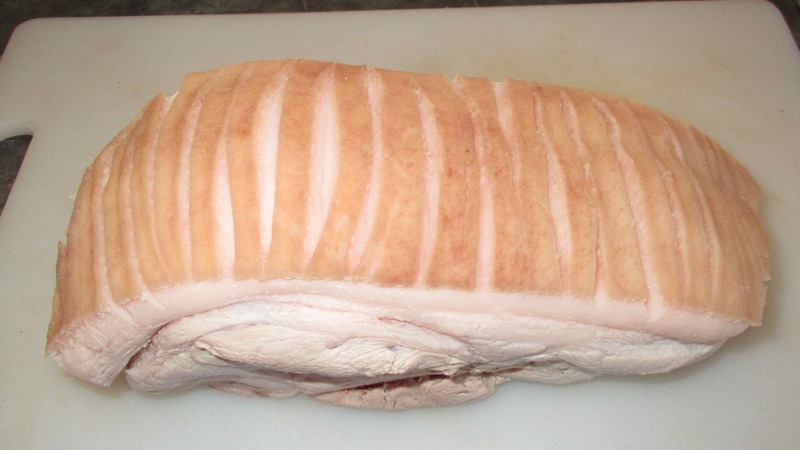 As per almost every recipe, and the way I have always done things myself, I used a sharp knife to score the skin in narrow strips, cutting into the fat but not the flesh beneath. The next step, being one I use with certain Chinese poultry dishes, was suggested in a few recipes I came across and consists of pouring boiling water over the skin to make it tighten. I used about two cups of water, mixed with a little sugar (as per one suggestion), and you can see how the cuts in the skin open up and the way that the meat gets a little blanched on the surface. 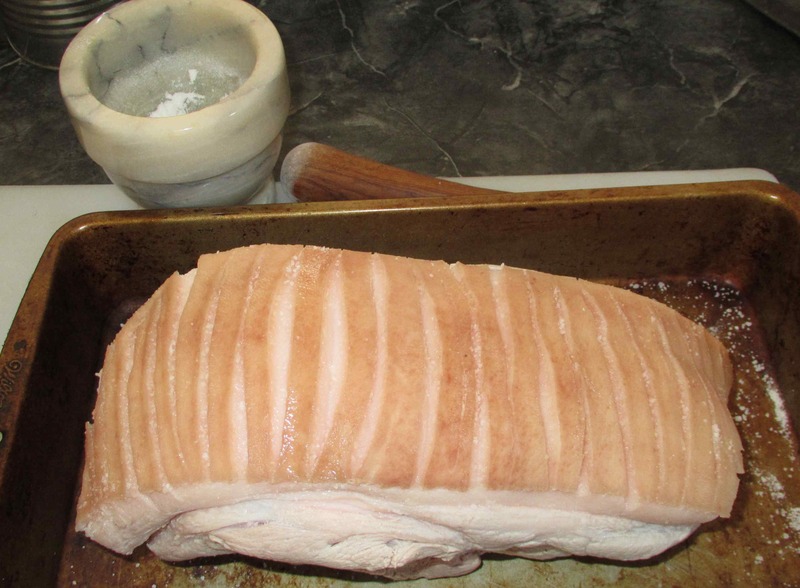 Afterwards, I rubbed the skin with coarse salt (about a tablespoon or so), making sure that some of the salt was worked into the fat between the cuts. I have always sprinkled pork skin with fat prior to roasting but never rubbed it in quite so vigorously, nor used as much. The next step, and one I think is critical to the whole operation, was to dry the skin by leaving the joint uncovered in the fridge over night. Many recipes I read made a point of saying that the skin should be completely dry before cooking (one actually suggested using a hair dryer) but the overnight in the fridge really seemed to do the trick very nicely. The next day I took the roast out a good hour before cooking to allow it to come to room temperature. Next, I rubbed the rind with vegetable oil, getting some into the crevices, and repeated the salt rub a second time. 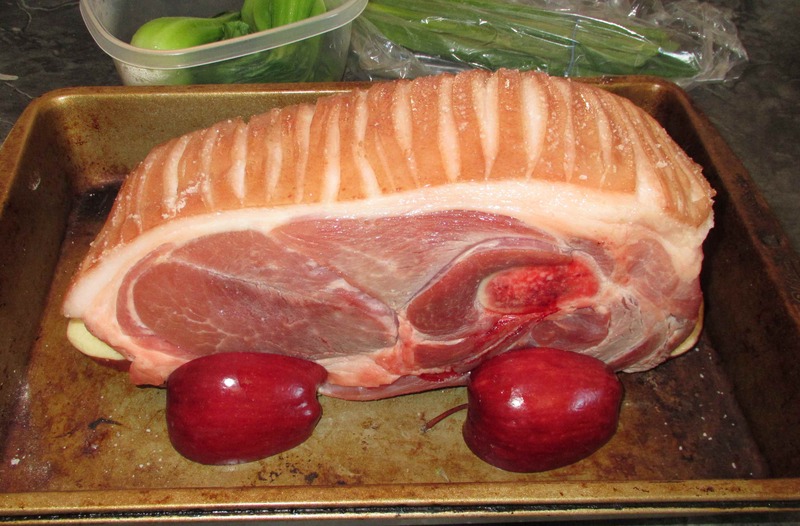 I seated the joint on a bed of apple slices (with some wedges along the sides to provide stability) and sprinkled the exposed flesh with a little garlic salt and pepper. There are as many different procedures suggested for roasting as there are recipes but what worked for me was to pre-heat the oven to 475 degrees and the pop in the roast for 30 minutes. I initially planned to go for 20 minutes but, after checking, the skin didn’t seem to be cooking fast enough and I was afraid I was going to have another failure. Just another 10 minutes, however, and I could see some nice bubbling and crisping happening and I turned the heat down to 425 for the rest of the roasting. For this joint, which weighed about 3 pounds, another hour was enough to raise the internal temperature to 160 degrees and it was ready to serve. I love that layer of fatty chewiness under the crisp shell. 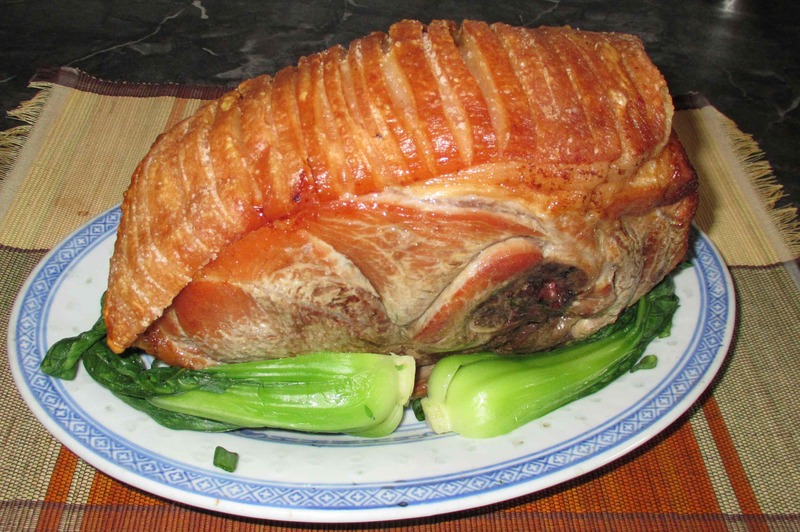 One of the reasons why “cheat crackling” or deep fried crackling doesn’t do anything for me. It’s too dry and more like a potato chip. It’s that chewy layer that coats your mouth with flavour. That looks lovely. 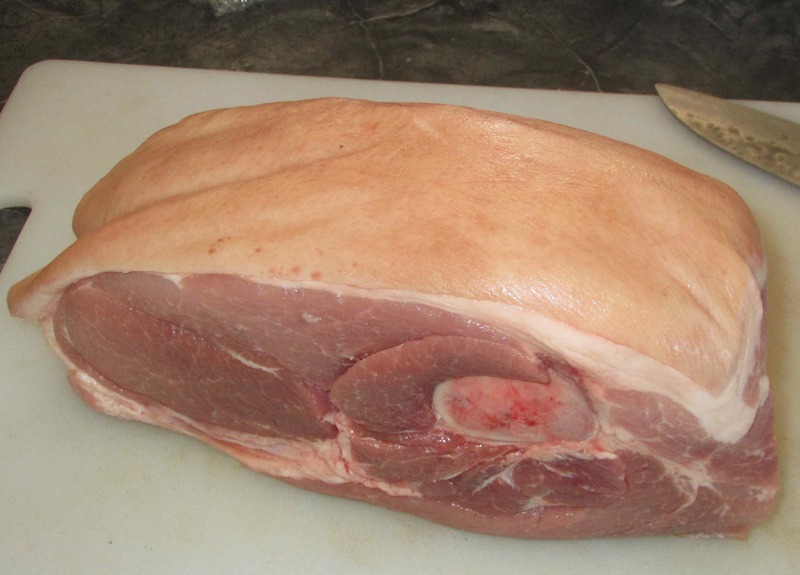 I will be posting a pork with apricot and onion. I managed to get a pretty good crackling going. i will post it in a few weeks (when the weather cools a bit here). Fantastic job with the crackling! I struggle to get crackling right. Sometimes the skin ends up being too chewy, other times it’s completely hard… argh! I’ve tried several of these techniques but not all at once. I’ll have to give it a go next time I do a pork roast. That’s always been my problem … okay in a few places but too crispy or too chewy elsewhere! Nicely done, John. I bet it was delicious. Thank you for your help ,I followed all things told to me and yet it’s not as crackly as i like and your’s seemed i could almost taste it . The drier you get the skin the better… almost hardened is perfect. Also, it really helps if fat isn’t allowed to settle on the surface anywhere. That prevents crispiness too…. I often get a couple of spots where this happens. CONGRATULATIONS on your success. The crackling in the first photo looks perfect. Is the Shanghai bok choy from your wife’s deck garden? I am hoping to get as nice a cut again soon. Am drooling! Looks beautiful. In addition to being delicious, it must have been so satisfying to have finally “cracked the code” so to speak. Bravo! I wish we could buy that cut more often here.